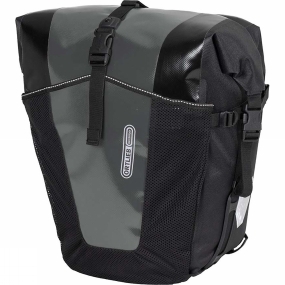 The waterproof Back Roller Pro Classic Pannier features an proven roll closure, an additional front pocket, and uses Ortlieb's ingenious and super-convenient QL2.1 mounting system. Those who hesitate to venture off on a long bike tour due to a lack of storage space will no longer have any excuses. Time to pack up and take to the road.Ortlieb's QL2.1 mounting system uses hooks to attach the pannier directly to your bike rack. This means the panniers can be easily switched from one bike to another. Inserts can be used which allows the hooks to attach to racks of 8, 10, 12 or 16 millimetres in diameter.